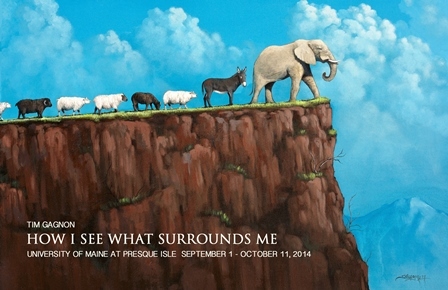 he University of Maine at Presque Isle’s Reed Fine Art Gallery will present How I See What Surrounds Me by Tim Gagnon from Sept. 1 through Oct. 11, 2014. The public is invited to view the exhibition throughout the show’s run and attend the Opening Reception on Sept. 5 from 5-7 p.m., which is being held in conjunction with the Presque Isle First Friday Art Walk. The Reed Gallery will hold a Gallery Talk with Gagnon at 5:30 p.m. The Reed Gallery is proud to present the work of painter Tim Gagnon, an Aroostook County native whose work is far reaching: in 2012, he was named one of the Top 50 Emerging Artists by Art Business News. His work is collected across the nation and in 30 countries around the world. In 2011, he was the Art Expo Challenge Winner out of 700 artists. A former UMPI Fine Art student, Gagnon’s work draws from his mind, often reflecting his love for nature. Aside from being a successful painter, Gagnon is an accomplished painting instructor. While he offers many workshops live, around the country, he has a faithful following on his website where he offers painting instruction (and over 84,000 YouTube subscribers). For more information about Gagnon, visit his website at www.timgagnon.com. In addition to its First Friday reception on Sept. 5, How I See What Surrounds Me will be open for the First Friday Art Walk on Oct. 3 from 5-7 p.m. Please follow gallery happenings on the Reed Gallery Facebook page, www.facebook.com/ReedArtGallery. The public is encouraged to come out to First Friday and attend this free event. Light refreshments will be served.